Winter in July // Free Smashbox Cosmetics! 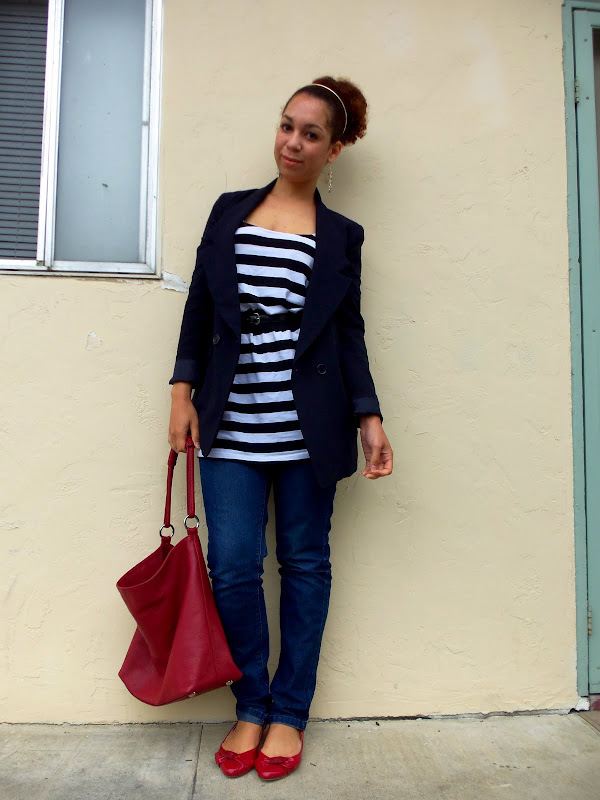 Forever 21 top and blazer, flea market jeans, Express bag, Amberie earrings, gifted flats. Sorry for the dark photos - there is no sun today. Middle of July, and it's 54 degrees out. Insane. Remember this, uh, top? Last time, I wore it as a dress. Oops. I received an e-mail from Smashbox Cosmetics today - they have an awesome promotion going on: every Tuesday and Thursday when you make a purchase, you'll receive a free, full sized sample with your order! And, if that wasn't enough...free shipping, and even more free samples. If your order is $75 or more, you'll get a $15 discount*! No, they didn't ask me to say anything: I'm just too excited to keep this to myself! I love Smashbox! I wear their Lash DNA mascara. Do you use any of their products? 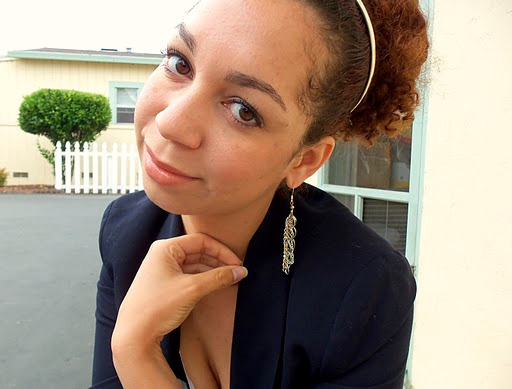 Don't forget to enter into my jewelry giveaway! That is the cutest outfit ever! so so so very french! OOh I love this outfit!! Cool ! 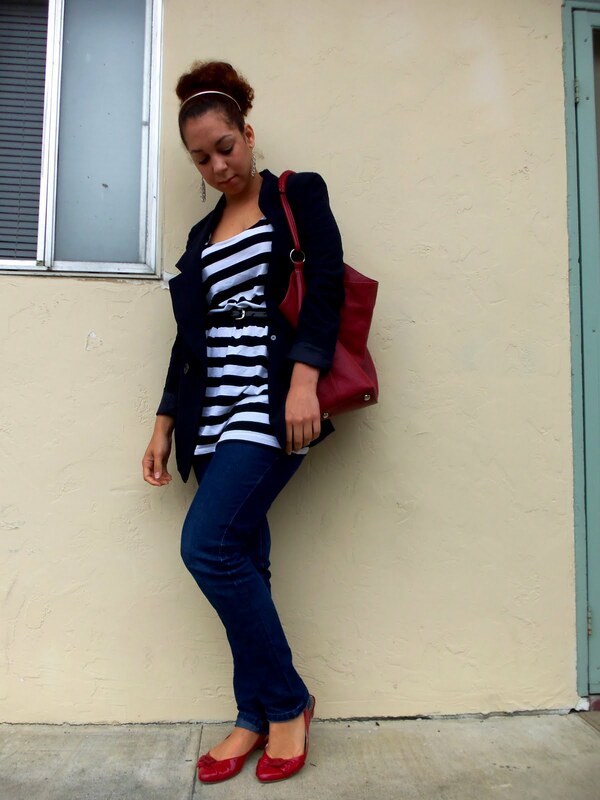 I just did an outfit post on my blog this morning with stripes and red shoes lol. Great minds think alike. Love this classic, nautical look! lve your outfit!! the stripes with red are so cute! i LOVE your outfit ! 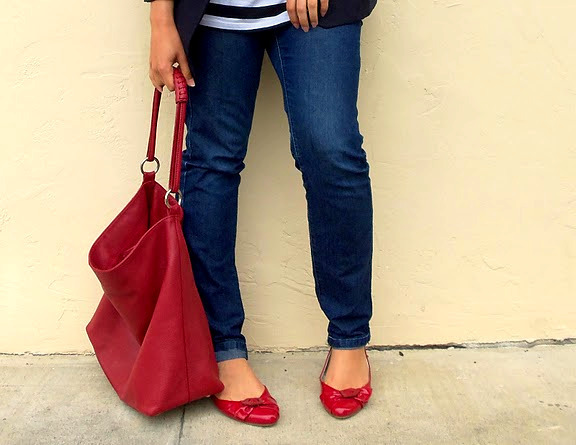 stripes, and red pumps are too hot ! Looks very Parisian chic - I love the red highlights against the navy.